The Chinese fertilizer market is generally a commoditized industry. We use a multi-tiered branding strategy to target different market segments with our tailored products. 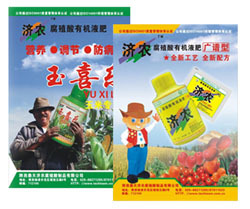 Currently, We have three brands: Jinong, Keba and Tianjuyuan. Although we use TV advertisements and other mass media techniques, the majority of our marketing efforts are conducted through joint activities with our distributors. We retain a staff of over 600, who do on-site marketing using pamphlets, brochures and posters at point-of-sales outlets. Our staff works with and trains our distributors and retail clients through lectures and interactive meetings. We emphasize the technological component of our products to help the market understand product differences. Word-of-mouth advertising and sample trials of new products in new areas are essential. Also, nation-wide hotlines have been set up to answer customer questions. We are always looking for new ways to promote our services, an example of which is the SMS platform we are constructing to have real-time interaction with farmers.